New music ensemble thingNY presents Paul Pinto’s mini_004 and Andrea La Rose’s eudaimonism, improvisations of the non-pop variety, and portions from their experimental operas ADDDDDDDDD and Jeff Young and Paul Pinto, Patriots, Run for Public Office on a Platform of Swift and Righteous Immigration Reform, Lots of Jobs, and a Healthy Environment. Also on the program, electroacoustic performers Amy X Neuburg (Bay Area composer/vocalist) and Todd Reynolds (founding violinist of Ethel), as well as thrash violinist, Joey Molinaro. Throughout Lower Manhattan at various locations: MAP coming soon. Members of thingNY and the groups Why Lie? and the Panoply Performance Laboratory have collaborated as a newly formed collective called VARISPEED to remake Robert Ashley’s seminal television opera, Perfect Lives. Presented by PERFORMA ’11, each episode has been newly arranged by a member of the group. These arrangements feature fresh takes on instrumentation, amplification, and melodic content, while still maintaining the formal, metric, and chordal frameworks of the originals. Perfect Lives Manhattan is not a imitative interpretation of Ashley’s Perfect Lives, but instead seeks to reanimate Ashley’s material in new ways, stemming from the Varispeed members’ own individual relationships with the piece. Arranged and performed by Gelsey Bell, Paul Pinto, Brian McCorkle, Dave Ruder and Aliza Simons. This is a free performance but we would really love to document it properly with HD video and a quality sound recording. Please consider giving a small donation via our IndieGoGo page to help us do this. First big band show of the season! 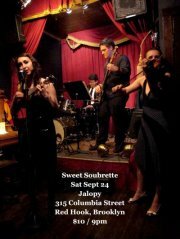 Featuring the amazing SS horn section and Stacy Rock on backing vox, for a grand total of 8 musicians on the Jalopy stage. Not to be missed! Also, the Ukuladies will go on at 10:30 and they are great. $10 cover. SWEET SOUBRETTE RETURNS TO BROOKLYN WITH BIG BAND LINEUP Ukulele-powered indie rock gets brassy at Jalopy on 9/24 Sweet Soubrette, a ukulele-powered, cabaret-tinged indie rock band often compared to Amanda Palmer and The Magnetic Fields, returns to Brooklyn in big band formation after a summer hiatus. This show will include new material and will pack the stage with a full brass section featuring members of the Hungry March …Band and new music collective ThingNY. This concert is funded in part by the City of Richardson Arts Commission. Tinderbox Music Festival is an annual event showcasing a powerful and diverse lineup of established and emerging female artists producing innovative original music. Rooted in the vibrant New York City music scene, Tinderbox fosters community by providing opportunities to perform, collaborate, and connect. Tinderbox also donates 100% of its net proceeds to organizations involved in empowering the next generation of female artists including GIRLS WRITE NOW (http://girlswritenow.org/gwn/), an organization providing guidance and opportunities for NYC’s underserved high school girls to develop their independent voices and explore careers in professional writing, and the WILLIE MAE ROCK CAMP FOR GIRLS (http://williemaerockcamp.org/), a non- profit music and mentoring program empowering girls and women through music education and activities.